We offer both Manual and Electric Paper Cutters and Corner Rounders. These paper cutters and paper trimmers are great for any project whether you are cutting stacks of paper or trimming paper for a photo album. The trimmers are handy for small projects for offices, hobbies, schools and churches. The larger paper cutters work well for print shops, churches, schools and more. FREE SHIPPING ON ALL PAPER CUTTERS. Designed To Cut Through Multiple Sheets At A Time. Comes With One 1/4'' Cutting Knife. Ideal For Large Jobs That Require High Productivity. Comes With 2 Cutting Knifes and cuts up to 200 sheets of 20 lb paper. Electric Punching Up To 600 Sheets Of 20 lb paper. Includes one Cutting Knife. Electric Punching Up To 700 Sheets Of 20 lb paper. Includes one Cutting Knife. Rugged and Compact this Guillotine Cutter is ideal for Small Print Shops who produce brochures, invitations and more. Cuts Stacks of Paper up to 5/8” High and up to 14.5” Wide. With LED Laser Line Accuracy this Cutter Easily Cuts Stacks of Paper up to 18.7” Wide and up to 3.15” thickness with Razor-Sharp Precision. Includes an all Metal Stand and feet for tabletop use. 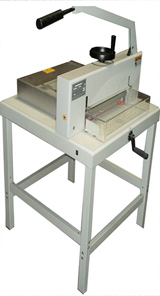 Semi-Automatic Paper Cutter offers Precision Cutting for Paper Stacks up to 16.9” Wide and up to 1.75” high. Accurate cutting is easy with its spindle-guided back gauge with LED digital readout and calibrated scales.